Nightingale Home Support & Care, Inc is a very unique home health care agency that caters to the needs of affluent retired professionals and older adults who wish to delay or avoid the need for Assisted Living and Nursing Home facilities. Cleveland and the surrounding areas. 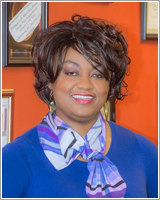 Stella Nsong is the state director of the Ohio Elder CarePlanning Council and the CEO of the Caregiver Relief Network. She is a certified dementia practitioner and certified professional geriatric care manager. Earlier on in her career, in 1990, she won the Gold Medal for practical nursing in Georgia.